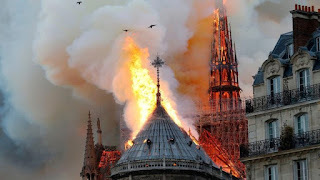 Within 24 hours of Monday’s blaze, French companies and local authorities had pledged more than 700 million euros to rebuild the cathedral, including 500 million from the three billionaire families that own France’s luxury goods empires Kering, LVMH and L’Oreal. The fire has also promoted fundraising among Americans, with New York-based French Heritage Society and the Go Fund Me crowdsourcing platform among the first to offer help. The heritage charity Fondation du Patrimoine said it was too early to estimate the cost of the damages. Authorities say they suspected the fire was caused by accident.